As a Non-Consumer, there’s a built-in lag time between the moment that I decide I want/need something and when I get it. Often times that lag time cools the want/need to the point where I realize that the whatzit is actually unwanted/unneeded, which is awesome, (not buying stuff = huge savings) but more often I’m able to figure out a creative solution to the original want/need dilemma. The extra time to come up with a creative solution doesn’t occur if I go the Target/Home Depot/Ikea route. My most recent example of this was a mirror and some mirror clips. You know, those clippy-things that allow you to attach an unframed mirror directly onto a wall. I’d never been to this particular Goodwill before, and my expectations were low as the surrounding area is neither residential nor affluent. (Goodwill keeps costs down by selling stuff where it’s donated.) I was mostly killing time, and I would have been happy to leave empty handed. However, there was a vintage round beveled glass mirror that caught my eye. Priced at only $4.99, I knew I would regret not buying it. Did I need another mirror, did I picture where it would even go? No, but I knew I could always resell it at a profit if I changed my mind later on. 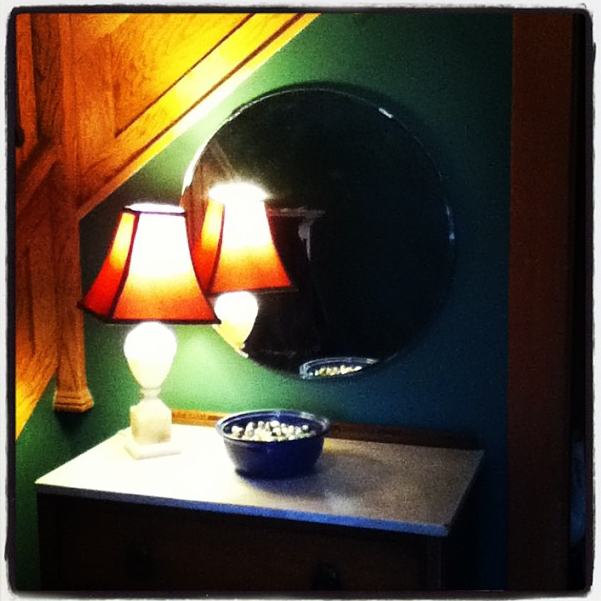 The mirror sat in the living room for a few days before I realized that it would look perfect on my entryway wall. This wall is all angles, so a square or rectangular mirror doesn’t work, but a round mirror would be perfection. For the past six years or so I’ve just leaned an antique rectangular mirror again the wall, but this had been a temporary solution. I was dropping a different mirror off to be cut yesterday and planned to buy some metal mirror clips. Unfortunately, the clips were priced at $22 for four. (Gulp!) So I chose the plastic clips, which were free. I didn’t want to use plastic clips, as I felt they would cheapen the look. But an alternate solution came to mind, which was to switch out the plastic clips for the nice metal clips that had come with the full-length mirror in my son’s room. Plastic clips on mirror in son’s room = not noticeable. Plastic clips on mirror in entryway = very noticeable. Luckily my husband was off from work yesterday, so together we switched out the clips and installed my new Goodwill mirror, which I do have to say gives the space a cool art-deco vibe. Wait . . . what was my point here? Oh yes, non-consumerism forces creativity. If I had just gone to Target/Home Depot/Ikea I would have likely found what I needed. However, I wold have spent a fair amount of money and I would not ended up with a unique look for my home. Give your wants and needs time to percolate and a creative solution will likely present itself. This is very similar to my strategy of putting it out to the universe. I can’t even tell you how many times I’ve chit chatted about needing X or not wanting to pay for Y or what have you, only to be told… Oh, I’ve got one of those or if you got to blahblahblah they just give those away. Same principle, give your self time, don’t give in to instant gratification, let it simmer and often $0 need be spent. “Let it simmer” should be my second tagline. A few weeks ago my husband helped a friend replace a dishwasher and brought the old one home. Before I could get it on craigslist, my brother-in-law mentioned that he was going to have to replace the dishwasher in their beach house (mobile home really) and was going to try and find a used one. It was so fun to say “Oh, I’ve got one in my garage that you can have”. You never know who is going to have what you need. Get the word out. Agree with Dogs or Dollars….not just on getting what I need but passing on something I am not really using and a friend has a need for. Or if I am unsure how to fix something or make something work for me in the home, talking with someone else lots of times provides me with a solution I hadn’t thought of. Or, it is a springboard to get me to think “out of the box” to come up with an ecomonical re-do or find something used that will work just great. My own phrase for this process is “putting it on the back burner” (the cooking metaphor seems irresistible). My husband goes to the heart of the matter with “Patience is all.” Either way, don’t rush in immediately to solve a problem that isn’t an emergency, and a solution is likely to present itself. This is exactly what I need to do. Wait before I purchase. I bet I could come up with some pretty creative solutions before I spent money. Thanks for the reminder!! Yup – totally agree! And how wonderful to find things where you least expect them. On another channel, I’m missing your pre-instagram photos. Your photos were beautiful and the things in them visible… Perhaps I’m just not an instagram fan, AND a partypooper, but that’s just my vote. You, of course, should continue to do whatever makes you most happy, but I’ll look forward to the (hopefully soon) end of the instagram honeymoon. The cord that I use to download photos from my camera is in a desk drawer this is stuck closed. I’ll figure out how to get it open, but this morning was not that time yet. So awesome. Must tell you that I have never seen a mirror at my Goodwill. Been looking for one for my daughter’s room. Also, two thrift stores closed in the closet town with thrift stores. U are really lucky where u live. I have bought two great mirrors at Goodwill, and they’re a common find here in Portland. That is a really groovy mirror. I need to get better at leaving things up to the Universe. I tend to be NOW NOW NOW. My frugality has forced me to be for creative too. To make it do. And honestly, isn’t it more fun this way? I mean how boring to just go to the box store for everything! Super boring. Plus, new stuff is generally poorer quality than vintage, so it fall apart within a few years. An 8 foot round ottoman?! Did you take it? And how did you transport it? And . . . pictures, please! There’s a Goodwill store on one of my favorite walking paths so I often do a quick walk-through when I pass by. Yesterday I saw an oval mirrow like your round one…Goodwill twins? I found and bought a 3 dollar reading lamp as I tend to fall asleep reading with the light on since my room is chilly and the down cover is soooo warm. I don’t get the utility company though, I haven’t turned the heat on yet this winter but the bills don’t show much difference. Do they just estimate? I need to look into that. I’ve needed something on my wall in the dining area. I have 2 pictures but felt I needed something in the middle. You know the old balance thing. Looked around some, and while digging in my garden shed, found a cool wrought iron candle sconce. All curly cueing? and everything. It was in my sisters things I’d inherited, and it got put away. Well, After a half can of black spray paint (my best friend) it’s now in the middle of my wall. Sometimes those little things you do can make you feel so smug!!! After my bed bug debacle last summer, I encased my mattress and box spring. The encasement drooped down over the edge of the box spring and was visible since my quilt isn’t long enough to cover it. It has bothered me visually for months…..then yesterday I cam across a piece of fabric in my closet the perfect color to make a faux bed skirt. I just stuck the fabric between the mattress and box spring and adjusted the length to cover the encasement…..pretty, free and much more pleasing to the eye. Katy, I’ve been dying to boast about a recent fix to someone and when I read this post I knew you were the right person. When we moved to a different house about 6 months ago the little plastic silverware bucket that goes with the drying rack got broken. For 6 months I cursed silently (ok, sometimes out loud) as I fished spoons, etc out from under the rack where they had fallen after being dumped just anywhere to dry. I looked at various stores when I happened to be out but it seems you can’t buy that part, only an entire new rack. I couldn’t bring myself to do it. Not even Goodwill had anything. Finally this weekend I got fed up and got out a tall tupperware (the kind you get soup in from Chinese takeout), drilled some holes in the bottom and clipped it to the rack with a bag clip we never use. Voila! It’s perfect. I’m so happy to wash silverware now and drop it in that darn bucket. Previous post: What Kind of House Would You Get if You Paid Cash From Your $20,000 annual income?